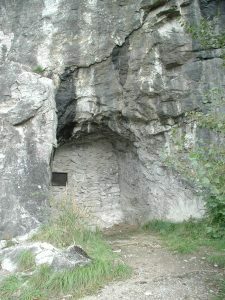 The Czech Republic also has one closed repository which is located around three kilometres east of the town of Beroun in the abandoned Hostim I (also known as Alkazar) limestone mine. In the 1990s a detailed inventory was made of the waste disposed of and, finally, it was decided to permanently seal the facility, which took place in 1997. Since this time the site has been monitored by SÚRAO on a regular basis. The mining of limestone was conducted in the Alkazar quarry in the first half of the 20th century. The limestone was transported from the Hostim I and II quarries to Beroun via a narrow-gauge railway line, the remnants of which can still be seen alongside the Beroun road. The mined material consisted primarily of high-percentage Slivenec and Koněpruské limestone which was used principally in the metals industry. The total volume of the two waste-containing passageways is around 1,690 m3. The actual operational period of the repository lasted only for a very short time. The first waste packages, originating from the Institute for the Research, Production and Utilisation of Radioisotopes (ÚVVVR), arrived at the Hostim facility in 1959 and operation was terminated in 1964, whereupon responsibility for the safety of the repository was assumed by the State. Following privatisation, a private company conducted an inventory of the disposed of waste as well as radiation and mining surveys in both tunnels in the period 1991 to 1994 which confirmed that emitters and packages containing higher-activity waste were indeed transferred to the Richard repository in Litoměřice in 1964. This inspection also showed that the risks associated with the reprocessing and transport of the remaining waste to another location would be significantly higher than those associated with leaving the waste in the repository. The best option therefore was to fill both tunnels with a concrete mix. Final closure of the repository took place in 1997. In the period 1990 – 1991 a hydrogeological monitoring system was constructed in the vicinity of the repository which is operated by SÚRAO as part of the institutional control process.